My hat is from Amazon (click here) and it's in the color Ivory. It keeps selling out which drives me nuts (!!!!) but my fingers are crossed that it will come back in stock! My scarf is from Cents of Style called Rome Solid Blanket Scarf in the color Ivory. They have several different colors and even patterns if you're looking for new designs! My coat is an oldie from Old Navy and I don't think they have this particular color available any longer, but they do have a cute burgundy one (click here) that I think is probably actually even better. My pants are (of course) from Old Navy (click here). I've raved about these for probably 70 bajillion years but I can't say it enough - they are amazzzzing. Super stretchy. Great mid to high-waist. Stays a true black no matter how many washes. I can't get enough of them. Lastly, my new favorite boots!! They are from Nine West (click here) and I bought them directly from their website. I love that they are red and that they have these cute little bows on the side! I am obsessed!! 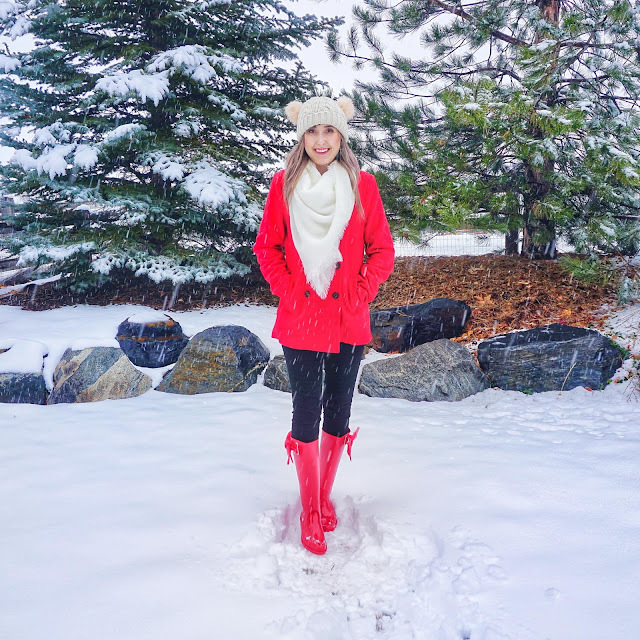 I tried them on after wearing my Hunter boots and I can say that they were pretty similar in the quality of keeping my feet away from the snow. I will say that they are shorter than Hunter boots so if you're looking for length, these will be just a tad short!